A full colour, 208 page anthology filled with all-new illustrations, comics and short stories that explore reimagined mythology. As you all know, shipping has been underway for the past month or so. We’re still working away to get all of your packages to you! Many of you have your tracking numbers now, with some US backers already receiving their copies of the book. We’re so excited to hear from you enjoying the book! Though shipping is well underway, we are still making our way through all the packages and not all have been shipped yet. Please do not be alarmed if you have not yet received your tracking information! We aim to finish sending off the last packages in the next week or two, but we will be certain to notify you all when all packages have been officially shipped. 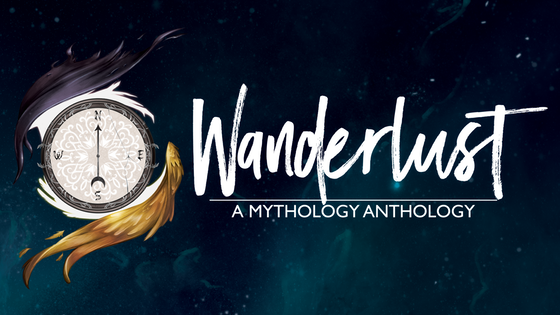 At that time if you have not yet received your shipping information, we ask that you notify us via message here on Kickstarter, or via email (wanderlustanthology2017@gmail.com) letting us know so we can sort things out. As always, we thank you all for your patience and support. We’re so excited to be on this final leg of the journey with you all! Great news! The books have have finally arrived! We love how they turned out, and we think you will all love them as much as we do. See below for pics! We have begun the process of preparing for shipping (packing parties over the weekend! ), and will be sending copies to backers as soon as Monday October 8th (Tuesday the 9th for US packages as the Monday is a public holiday). Addresses are now locked down (with a final window of 48 hours for last minute changes, and you should all have gotten a notification). You must provide us with an accurate shipping address. If not, your package will be sent to the wrong address and we cannot track your package down in that situation. Once your package is shipped, you will get a notification with your tracking number! Shipping times will vary, but should hopefully be getting to everyone in the next 2-3 weeks. In other news, our digital sketchbook will be released and sent to backers on Oct 26? as a PDF. Inside you will find sketches and process shots from a few of our artists, some fragments of stories that didn’t make it into the book, and a short story by our guest writer, Imara Tettey. We thank you all so much for your patience and understanding throughout this process. We’re so excited to be on the VERY LAST leg of this journey with you all. As you all know, the books have been printed and shipped - we are still waiting for them to arrive at our doorstep! Since they are being shipped from overseas, we have no way of knowing where exactly they are, but we do know that they should be arriving to us very soon. Hopefully, within the next week or two. When they do arrive, we will begin shipping them immediately to backers, and we will let you all know! All of you should have provided a shipping address when you filled out your survey. However, we know that there are backers who may have changed their address in the time since then. If that is the case, please notify us immediately! You can change your shipping address yourself by revisiting your survey link. If you don’t have that handy, you can shoot us a message via Kickstarter, or email us. If you email us, please include the name and email address that you used to back our Kickstarter. That way, we can resend your link and you will be able to change your address! As always, thank you for your patience, and please always feel free to reach out to us if you have any comments, questions, or concerns. Just a quick update regarding the physical rewards: books are currently almost completely printed, so we are just waiting on them to be sent to us. As soon as we have them on our end we'll begin packing and shipping all physical rewards! Regarding people who have not received their PDFs: we've checked with Backerkit and there don't seem to be any technical issues regarding people getting their PDFs besides the distribution emails going into spam, so if you still haven't received your link please check your spam folder again, and if it still isn't there send us an email at wanderlustanthology2017@gmail.com! Hello wanderers! I've heard from several of you saying that you have not received your PDFs. The distribution was automated based on pledge rewards for each backer, so if you ordered a digital or physical copy of the book, you should have received the PDF on June 22nd, the day we announced distribution. If you pledged for those rewards and have not yet received your PDF, please send us a message via Kickstarter letting us know. This way I can 1. determine if this is just a few hiccups or a more widespread issue, and 2. send you your copy! P.S., be sure to check your spam folders just in case it ended up in there!